Population health has become a leading strategic priority across the industry, and the field has experienced tremendous growth over the past year. New collaborations, relationships and partnerships are being created with the goal of improving health, reducing costs and increasing access. Community stakeholders are partnering with established healthcare organizations, employers are building direct relationships with healthcare providers and patients are becoming more actively involved in their health and health care. Across the industry, stakeholders are working together to understand how best make the transition to value-based care. We are excited for the opportunities and ready to face the challenges ahead. Practicing population health is more important than ever! As healthcare leaders, we understand the implications of socioeconomic disparities and are working to transform care delivery to meet the specific needs of each community. Advances in technology, data analytics and precision medicine will allow us to harness and cultivate data and information into practical solutions. Join us at the 19th Population Health Colloquium as we showcase the groundbreaking work of organizations that are leading this transformational change! JCPH serves as the Academic Partner for the Annual Population Health Colloquium. 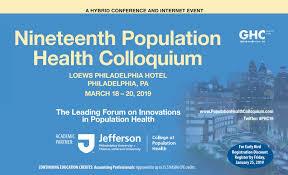 Click here to attend the 2019 Population Health Colloquium onsite in Philadelphia, PA.
Click here to attend the 2019 Population Health Colloquium via live video Internet in live streaming Internet video webcast of plenary sessions and listen to audio of preconference and track sessions. Following the event, an archive of the webcast will be available at your convenience at any time 24/7 for six months following the event.